This article is about an australian tennis player and doubles specialist Paul Hanley. A top player who has become top 10 player in doubles ranking and have won 25 Tennis ATP Titles. Here is given the profile and career of this player. Paul Hanley is an Australian Male Tennis Player who is a specialist in Doubles and has won many ATP Doubles titles in his career. Born on November 12, 1977, Hanley turned professional in 1997. Starting his professional career in 1997, Paul Hanley won his first doubles title by winning the Orange Warsaw Open in 2001. Hanley reached the doubles semi-finals of all the four Grand Slam Tournaments and a total of six times. 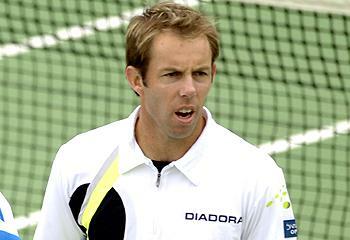 He reached his highest doubles ranking on 6th November 2006 of Fifth. He also won the Gold Medal in the Commonwealth Games 2010 held in Delhi in the Men's Doubles and Silver Medal in Mixed Doubles. Novak Djokovic defeated Rafael Nadal and wins Wimbledon Championship 2011 Men's title. Read here to know more about biography and tennis Career of Novak Djokovic and also get information about top ten ATP rankings. Roger Federar, currently ranking as the worlds Number 3 is a magnificent tennis player from Switzerland. He his famous for his one hand back handed strokes and is a champion on all surfaces. To know more about Roger Federar’s Tennis career, biography and profile check this Roger Federar wiki article. Robin Soderling, currently ranked as World number four is famous for defeating both Nadal and Federar. A magnificent player that he is for his two back-handed play, he is the pride of Sweden. To know more about Robin Sodering’s Tennis career, biography and profile, check this Robin Soderling’s wiki article. Andre Agassi, highest ranked as the World Number one is a former Tennis Player. He is famous for his right handed backhand strokes and is a name in the history of World Tennis making a number of records. To know more about this American tennis star, check this Andre Agassi wiki article. Peng Shuai, highestly ranked as World number thirty one player is famous for her both-sided strokes. Peng Shuai currently has been ranked as one of the top 5 asian players. To know more about Peng Shuai Tennis career, biography and profile, check this Peng Shuai wiki article.